Collier at right as Will Foreman, 1960. 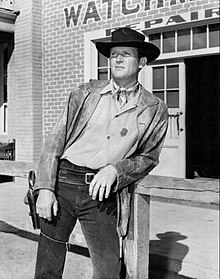 Don Collier (born October 17, 1928) is an actor particularly known for his role in television westerns during the 1960s. He played U.S. Marshal Will Foreman in the 1960–1962 NBC series Outlaws, with Barton MacLane (1902–1969), Jock Gaynor (1929–1998), and Bruce Yarnell (1935–1973). He appeared as a deputy marshal to MacLane in the first season of Outlaws and was promoted to full marshal in the second season, with Yarnell as the new deputy. MacLane left the series after the first season. Collier was born in Santa Monica, California. His only sibling, a sister, died when she was thirteen. After graduation from high school, Collier joined the United States Navy at the end of World War II. Upon his return to California, Collier obtained a part in the 1948 film Massacre River. The recipient of a football scholarship, he entered Hardin–Simmons University, a Baptist-affiliated institution in Abilene in Taylor County in West Texas. He transferred to The Church of Jesus Christ of Latter-day Saints-owned Brigham Young University in Provo, Utah, where he also played football. Collier has made more than seventy film and television appearances. He appeared with John Wayne, Robert Mitchum, Anthony Quinn, Dean Martin, Tom Selleck, James Arness, and Elvis Presley. After Massacre River, he acquired roles in Fort Apache (1948) and Davy Crockett, Indian Scout (1950) starring Fess Parker and Buddy Ebsen. Prior to his lead role in Outlaws, Collier appeared in the first seasons of both CBS's long-running Gunsmoke (1955) and NBC's powerhouse western Bonanza (1959). He guest-starred in 1957 in NBC's Wagon Train with Ward Bond during its first year on the air. One of his earliest television appearances was in 1952 in the syndicated Death Valley Days anthology series. In 1964, he played the role of ski lodge owner Peter Hayes in the Perry Mason episode "The Case of the Fifty Millionth Frenchman." He appeared in 1965 in Chuck Connors' NBC western series Branded. In a later Death Valley Days appearance, Collier was cast as Frank Dalton in the 1964 episode, "There Was Another Dalton Brother". In the story line, while starting his job as a deputy U.S. Marshal, Dalton must question Frank Johnson (Bill Zuckert), a suspect in a missing persons case. Johnson is the father of Dalton's girlfriend, Emmy (Laura Shelton). Strother Martin was cast in this episode as Charlie Neel, and Robert Anderson (1920-1996) played Marshal Heck Thomas. In the 1967 Death Valley Days episode, "The Man Who Wouldn't Die", Collier played Texas pioneer Josiah Wilbarger, who lived for eleven years after being scalped by the Comanches. Jan Clayton was cast as his sister, Margaret. "I'd like to think that the John Wayne 'school of acting' consists of three things: (1) Be on time for your call. (2) Know your dialogue; and (3) Don't leave the camera, even if you're not in the shot. So many times, especially if you're working with younger actors, the director says "cut" and, boom, they scatter like quail. They've got to go make a phone call or leave for a date. Duke usually ends up directing a picture about halfway into it and he wants his actors on the set. He doesn't want to have to look around for them at the honey wagon or in their trailer. He wants them there around the camera. If you remember those three things, you could work with John Wayne. He'd like you. Working with him was almost like going to school and learning the finer points working in the film business." From 1967 to 1971, he was cast as Sam Butler, the ranch foreman, in sixty-two episodes of NBC's The High Chaparral, a David Dortort series with Leif Erickson, Linda Cristal, Cameron Mitchell, Mark Slade, and Henry Darrow. In 1972, he appeared in George Peppard's NBC series Banacek and in CBS's family drama, The Waltons. In 1974, he guest-starred in the initial season of Michael Landon's NBC family western drama, Little House on the Prairie. A decade later, he starred in the first season of Landon's other NBC series, Highway to Heaven, with co-star Victor French. In 1976, he appeared in an episode of the CBS western series Sara. Collier's cowboy image enabled him to win the designation of the "Gum Fighter" for Hubba Bubba bubble gum. In 1989, he accepted the recurring role of William Tompkins in ABC's The Young Riders, based loosely on the Pony Express (1860–1861). He has also been a sidekick of Fred Imus, younger brother of Don Imus, on Sirius Satellite Radio's weekly program, Fred's Trailer Park Bash, from 2006 until Fred's death on August 7, 2011. ^ "There Was Another Dalton Brother on Death Valley Days". Internet Movie Database. Retrieved September 9, 2018. ^ ""The Man Who Wouldn't Die", Death Valley Days". Internet Movie Data Base. Retrieved June 6, 2015. ^ Armstrong, Richard. "Interview with Don Collier: "The High Chaparral" Star Talks About John Wayne and His Classic TV Westerns". Classic Film & TV Cafe. This page was last edited on 9 March 2019, at 02:50 (UTC).